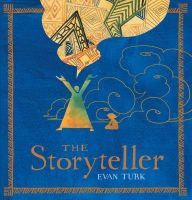 The Storyteller is a beautifully illustrated children’s book which uses images and text to share traditional folk stories from Morocco. The book tells the story of the Kingdom of Morocco which “had fountains of cool, refreshing water to quench the thirst of the desert, and storytellers to bring the people together.” As time went on and the Kingdom modernized, people forgot about the importance of the storytellers. When the storytellers stopped telling their stories, the wells dried up and the Kingdom faced a great drought. A young boy was left searching to quench his thirst and discovered the ancient stories of the storytellers which brought back the water to the Kingdom. The book is written as a series of stories within stories, a style that has long been part of Morocco’s oral storytelling tradition. While the beauty of the layers of stories may be a bit confusing to younger children, they serve to keep older readers engaged. Despite this layered style, the book still appeals to a wide age range, as the illustrations are captivating and draw in even the youngest children. The illustrations feature representations of traditional Moroccan dress, fabrics, rugs, and landscapes and weave together images in an elaborate way that mirrors the pattern of the stories being told. In a time when Morocco’s deep tradition of oral storytelling as entertainment, teaching, and historical reference is quickly fading, this story inspires young readers to reflect on the importance of storytelling. The illustrations often juxtapose traditional images with modern ones, giving a sense of the mixing of modern and traditional society. The author uses borders on the pages, inspired from Moroccan rug patterns, to keep track of the sub-stories, an interesting way of guiding readers through the different fabric of stories that the author weaves together. The illustrations, done in watercolor, ink, and pencil, are multidimensional and new things seem to surface each time one revisits an image. A detailed author’s note about storytelling in Morocco provides a cultural context for the stories in the book and inspires young readers to learn more about Morocco and its tradition of storytelling. The book also has a companion website http://thestorytellerbook.com/ which describes the significance of different symbols and patterns included in the book’s artwork. This is the first book which Evan Turk has published as both author and illustrator. His other books include Grandfather Gandhi by Bethany Hegedus and Arun Gandhi, 2014, Be The Change by Bethany Hegedus and Arun Gandhi, 2016 and Muddy by Michael Mahin, 2017. Evan was the recipient of the Ezra Jack Keats New Illustrator Honor and the Marion Vannett Ridgway Honor for Debut Illustrator in 2015. He is a graduate of Parsons School of Design and continues his studies at Dalvero Academy. Evan conducted extensive fieldwork in Morocco, including working closely with the storytellers in the famous Djem El-Fnaa square in Marrakesh to conduct fieldwork for this book.